I hope you all had a wonderful weekend! We finally had a weekend at home in Utah after being gone for so many, which was nice. Here’s a look I wore a couple nights ago out with my family. I have this top in black and white (it’s the same top I wore while on Style Code Live a week ago). 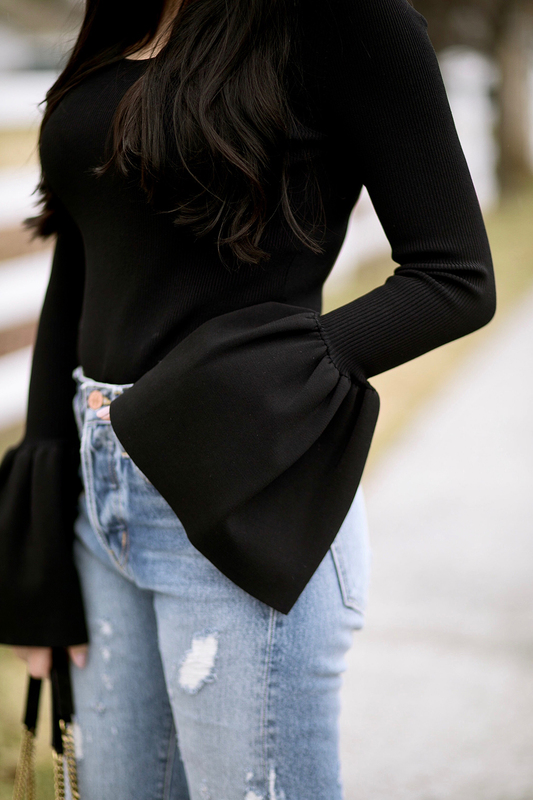 I love how the bell sleeves add a dramatic effect to a casual look! And these jeans are my newest obsession! I have a feeling we’ll be seeing a lot of faded, frayed jeans this spring, so it’s a trend I’m already embracing. We went to see my little sister Megan and her college dance team (the BYU Cougarettes) perform in concert and it was AMAZING!!! We went Friday and Saturday night because we loved it so much and because we could never get sick of watching Megan perform on stage!! Plus Isla Rose was completely mesmerized and loved every second of it! Also, in honor of President’s Day today I thought I’d share a few sales that are going on right now (see below)! Happy Shopping & happy extra-long weekend. Thanks for stopping by! Old Navy: Up to 50% off storewide!! Banana Republic: 40% off your purchase!! Nordstrom Rack: Clear The Rack Sale – extra 25% off clearance, ends 2/20! J.Crew Factory: 50% off everything!!! Thank you!! Hopefully you are able to shop the sales, so many good ones today! Love the bell sleeve on the blouse and the suede YSL. Fantastic! Nice outfit. Love your style. You’re looking so cute in this casual and Cali cool outfit! Love those jeans, such a great piece you can dress up or down! I like the boots! Looks like a nice fall day, what strange weather for February, right? Love those sleeves with the ripped jeans! Works so so well together! Am in love with this outfit, so cute and chic! Obsessed with these sleeves,Rach! You look stunning. I love the statement sleeves on that top! Those jeans are so cute, too. Oh my gosh so chic and edgy! Those jeans are fierce! The top with bell sleeves you’re wearing is NOT the same as the Elizabeth & James top on the 3 links you provided!! Why? Where can we find the ACTUAL top you’re wearing, which is much nicer than the links? Hi! I updated the links so they were right back on Monday afternoon and totally forgot to write you and let you know! I had been looking for so many cute, similar tops and you were right – they weren’t the correct links! But now they are! I’m usually so good about linking up exactly what I’m wearing, so thank you for commenting and catching the error! This sweater is so cute! So simple, yet so stylish! Those sleeves are perfect and I’m obsessing over your bag! Happy Monday! I love those bell sleeves. Thank you for sharing! I love all of the tops you have been posting lately! P.S. You look AMAZING for just having a baby a few months ago!!! Thank you!! You are so nice, I love hearing that, especially when I don’t feel 100% back to myself! Okay…I am in desperate need of some bell sleeves. It is just so pretty!! Love this look! Love your look, especially the top! Gorgeous! Kudos for you for trying a real fashion girl jean, but there are a few things to styling this type of demin. For one, the volume top is the wrong idea with this style pant. Volume can work, but not like this. The sleeves throws the proportion (which is the overall balance of the look) off. The pant is not working with this boot because while you took a cue from a trend six months ago to do a cropped jean with a boot, this isn’t the right heel height or jean length. This jean is really only going to work with a lower heel or flat, entirely because of the cut of the jean. It’s too tight in your waist. The look here is supposed to be loose and baggy, or the length needs to be longer. Just all around wrong fit/look. Give it another try with some different heel heights, and burn this top. Sorry. It looks cheap and ugly, saw it online at a store. Is there anything better than bell sleeves? This top is gorgeous! Adore your black and bold look! Love the bells on your shirt! LOVE THIS. Those jeans are amazing on you!